US corn futures found support from technical trade and ideas weekly exports should be good. 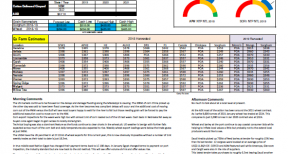 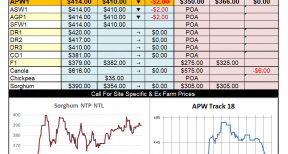 Wheat futures on the other hand continued to fall across the board as the punters predict another dismal number for US weekly wheat exports due out tonight. Looking around the world we see dry weather starting to become an issue in the northern half of Argentina but the southern half is looking very good and most believe the poorer yield prospects currently in the north will be countered by better yields in the south so steady as she goes for Argentine wheat at present. Canada released their stocks data and pegged wheat stocks at 6.18mt, a 9.9% drop from this time last year. Interesting to note durum stocks came in at 1.47mt, a few hundred k below what the punters were expecting to see. PDQ still estimate values for CWAD1 in SW Saskatchewan at C$245 for December, that’s a fall of about C$5.00 week on week. 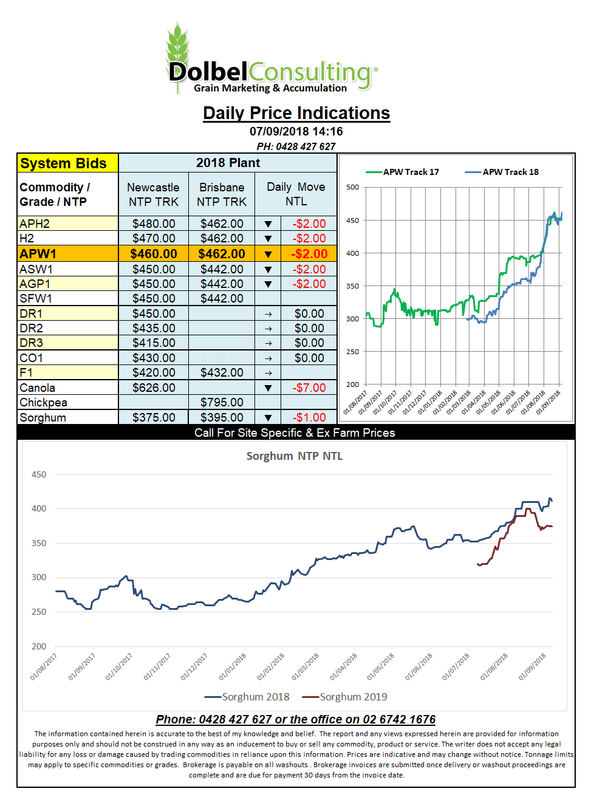 The roughly rolls out to about $370 NTP NTL equivalent here. 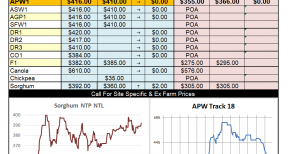 News of possible further damage to the S-NSW wheat crop due to frosts saw offer values for Western Australian APW wheat jump around US $6.00 / tonne. The offer value now works out at roughly AUD$480 delivered LPP end user.